The hospitality industry knows a thing or two about the importance of creating “instagram moments”, and Ibiza is no exception! The past couple of years, we have seen a huge rise in “Instagram” hotels, with hoteliers taking design to whole new levels. We can’t go a day scrolling through our Instagram feeds without a pretty picture of one of these famous hotels popping up- No filter needed. The following hotels are our top picks, sure to up your ‘gram game…. Wi-Ki-Woo boutique hotel is located on the sunset coast of San Antonio. Perfect for watching the sunset as you listen to Ibiza beats whilst sipping on your favourite cocktail. Just a few of the famous faces they see throughout the season include, Lottie Moss, Montana Brown and Joey Essex, who have all taken snaps in front of the perfect pastel coloured back drop. 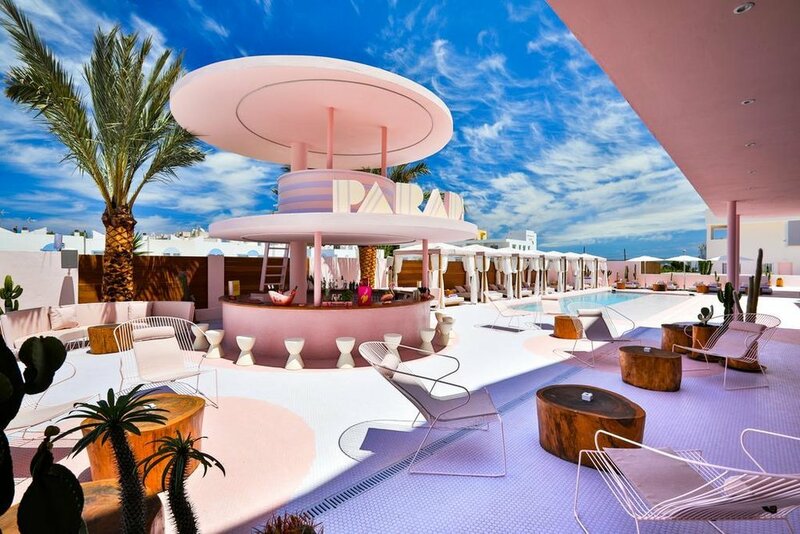 Paradiso Ibiza Art Hotel was decorated entirely by Ilmiodesign to look like a vintage Miami resort. The hotel is host to an array of fun and captivating contemporary art, meaning whichever room you decide to book, you’ll have a unique experience. The hotel's simple design is enhanced by coloured lighting - a bloggers paradise. The candy-coloured walls will immerse you in a marshmallow heaven. 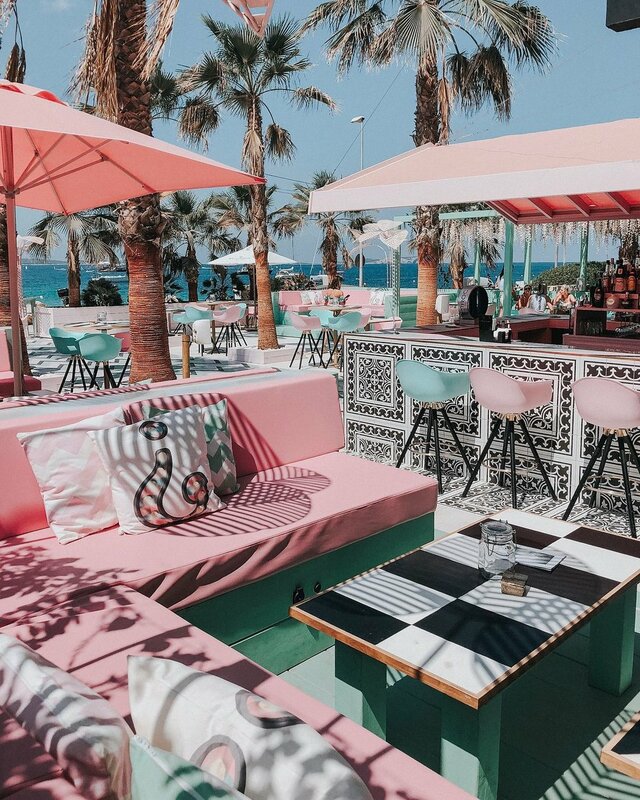 There is no place we would rather be right now than beside the millennial pink pool accompanied by the circle bar, transporting us to a kitsch and colourful 1970s Miami! Tropicana Ibiza suites are located in the party centre of Playa d’en Bossa, just a 10 minute walk to Blowout Ibiza. The hotels fun, contemporary style draws from the festive and colourful spirit of Ibiza, with the best selection of music and cocktails. If you love the idea of neon lights, pink flamingo sculptures, and a life-sized martini glass that doubles as a poolside shower, then this is the place for you. 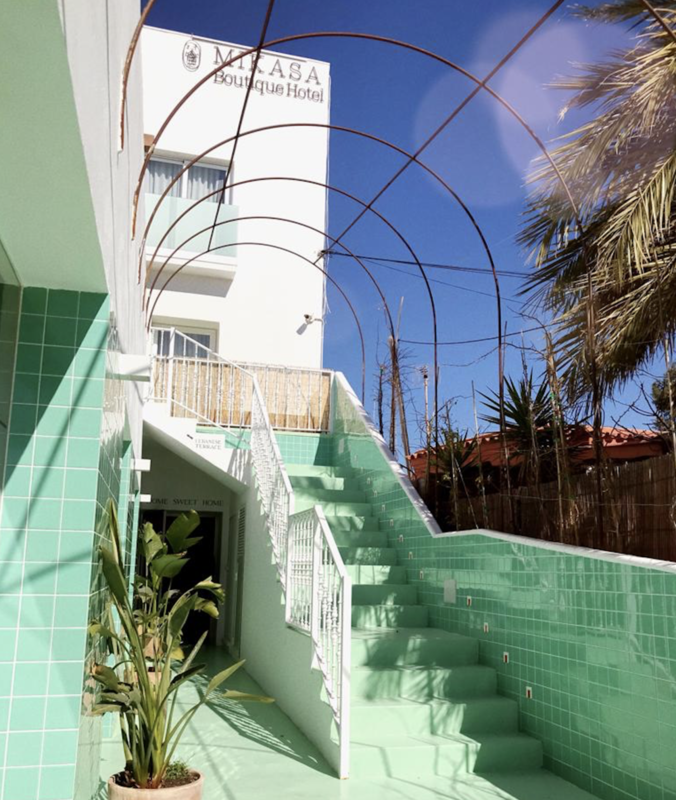 We are sure there will never be a dull moment at this Barbie-esque photogenic hotel, full of style and character. Mikasa is an Urban – Inspired boutique hotel located in the classy Marina Botaoch. With its glossy mint-green tiles, its hard to miss! A home-away-from-home, this luxurious yet understated hotel is home to rooftop terrace and a beautiful little restaurant serving un-complicated but delicious food, including a very reasonably priced set menu. Order one of the bar’s bespoke cocktails and head up to the roof- they taste even better with the magical views of the white Isle. The decor here is vibrant and cosy, with earthy bohemian elements that are true to Ibiza’s roots. BEST FOR: Instagram-worthy lunches on the terrace, followed by sundowners on the roof. Seven Pines Resort has been described as a small Ibicenco village with a not so small total of 186 individual suites spanned across a vast clifftop. The décor has a truly luxurious feel incorporating natural materials and a neutral colour palette with an occasional piece of statement furniture or wall hanging thrown in. Everything about this hotel screams Ibiza Luxury! The famous glass front infinity pool is an influencer’s dream posing spot; located on the cliffs edge with endless views of the Mediterranean Sea and the rocky island of Es Vedrà.